Don't miss out on the Michael Brennan Memorial Golf day, Sunday 6th May 2018. Running for the fourteenth year in a row, this Golf day held in Laidley is a fun event for all of the family. On the 20th May 2005 Michael Brennan, 26 years old, collapsed at work and was later diagnosed with a Glioblastoma Multiforme. The news was absolutely devastating for Michael, his wife, family and friends. From the huge groundswell of support the first “Cricketers for a Cure” golf day began on the Queen’s Birthday weekend in 2005. Michael was a life member of the mighty Laidley Blue Dogs Cricket Club and the support from the club has been enormous. St Mary’s Primary School has also supported each year with Michael being a past pupil. The Golf day has become an annual event and we have just celebrated a magic 11 years. The atmosphere on each of the days is something special to behold with reunion of old friends, the laughter and generosity of spirit of all the faithful workers clearly displaying all that is good about ‘community’. Poet Rupert McCall’s rendition of “Queenslander” each year is a highlight and seems to epitomise the spirit of the day. Sadly Michael passed away on 25th September 2011 after a gallant battle. 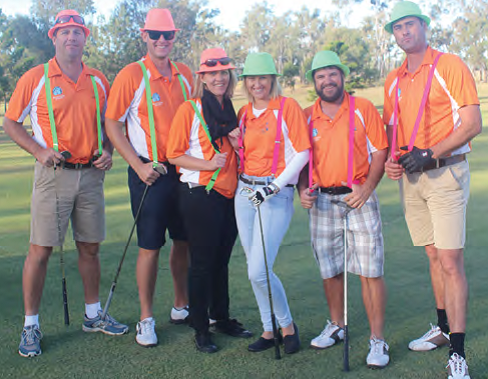 The “Cricketers for a Cure Michael Brennan Memorial Golf Day” has continued and the enthusiasm for a cure has not waned. The family and friends are passionately inspired to support the quest for a cure of this devastating disease through research. Members of the Committee have designed and produced items in the brain cancer awareness colour of orange such as shirts, hats, stubby coolers. What a wonderful sight it is to see the sea of orange all over the Golf course on the day. Sadly, Blue Dogs stalwart Peter Woods’s mum has fallen victim to the same dreadful disease and it is a poignant reminder to everyone that brain tumors are way too prevalent. We will continue to gather each year for the cause. The “Cricketers for a Cure, Mike Brennan Memorial Golf Day” for 2015 raised just over $7,500 bringing the total money donated to the Newro Foundation to over $80,000.